I’ve turned out to be a rather rotten blogger. I have this idea of only writing where there is something appropriate and relevant and then somehow not getting back to it for a few months. 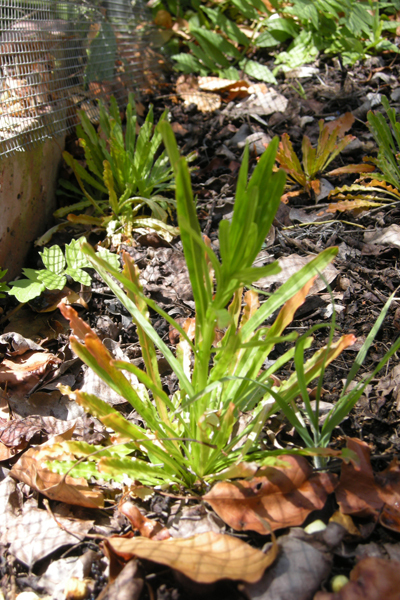 The plants last seen around September 14 have mostly survived. 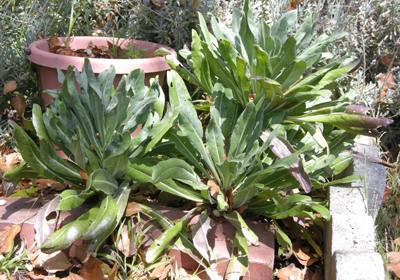 Woad in porch planters were eaten by something. 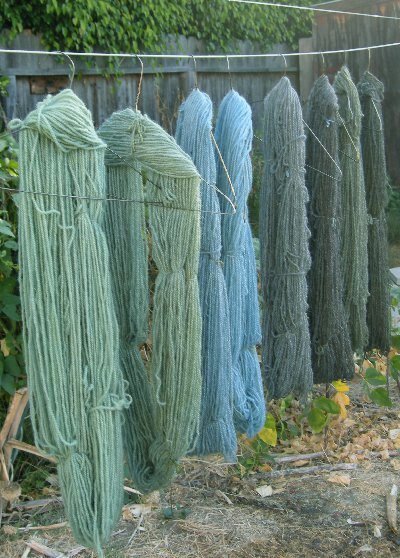 The Woad in the yard took off though one Weld didn’t survive. Additionally I have some more seeds in flats that will hopefully take off. 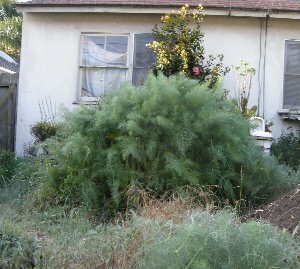 Due to drought conditions – I’m in southern California – there are watering restrictions. On my street odd numbered addresses have Mon, Wed, Fri and Sunday, before 9am and later in the evening for watering. For awhile now I’ve been using dish (washing) water on the dye plants and they seem to be doing ok along some shade from the tree. 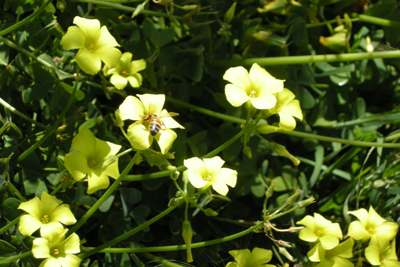 My other yellow dye staple is Oxalis, aka the Weed-that-does-not-die. 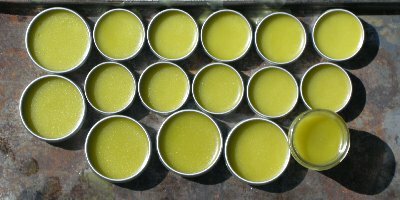 That one is of course did well for it’s seasonal appearance and keep a lot of bees happy while providing me with a good supply of yellow/orange dye. If you ever forget that parts of Southern California are desert under all the asphalt, an automotive breakdown in the San Fernando Valley will be your reminder. Cotton however did really well and I had enough for various guild friends and myself. 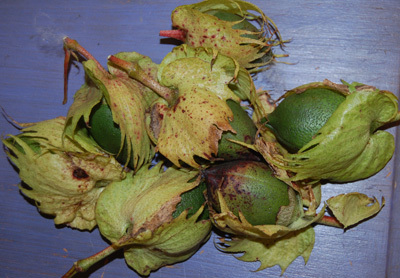 Some of the bolls that haven’t opened yet I bring in doors and leave in a warm spot – window, by heater, bowl near the stove – and they open later. 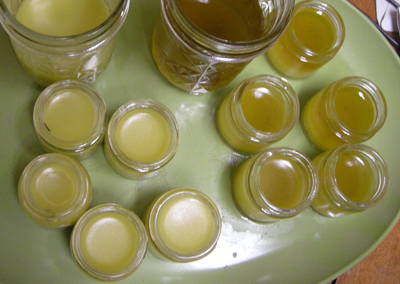 Evan managed a batch of plantain salve. 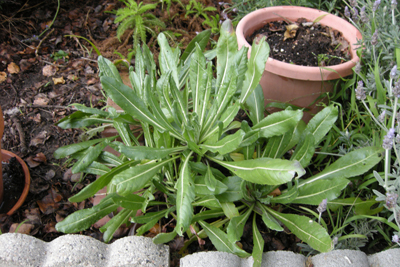 (Plantain the herbaceous plant not the banana.) 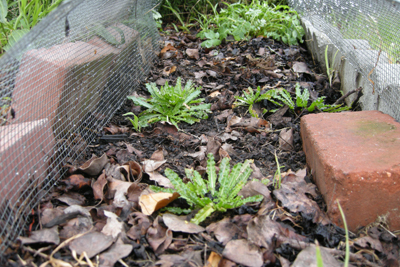 Yay for the garden “weeds”! 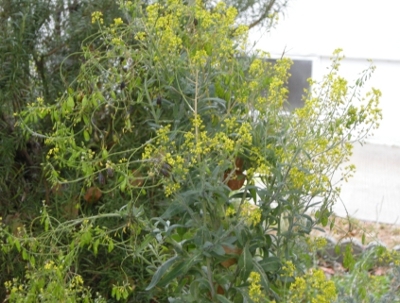 The Woad in a planter however still isn’t doing well though the Woad in the ground continues to flourish merrily. 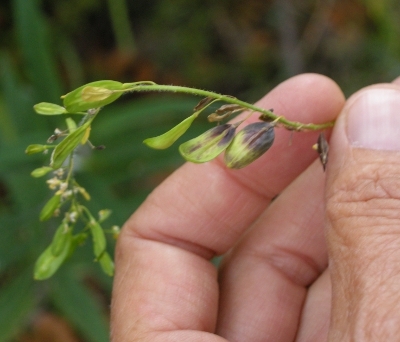 Weld also growing. Hand in the 2nd picture to give an idea of the size. 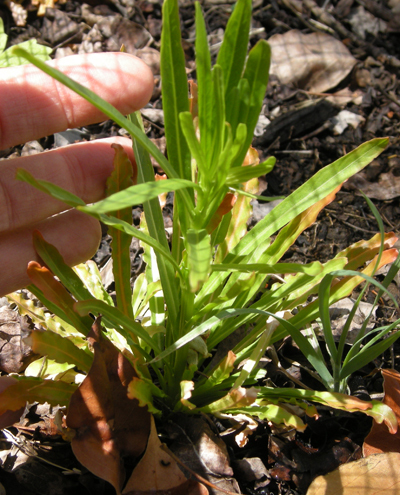 They are still small plants but tend to shoot up in the spring. 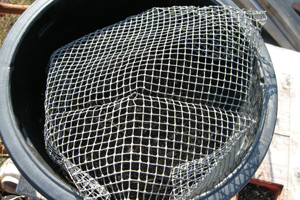 I start them off with a cover of hardware cloth (wire mesh) to protect from local wildlife that like to roll and dig into new beds. 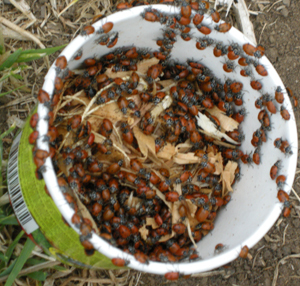 Just removed the cover this week since I think they are large enough to be safe. I haven’t written for quite awhile. 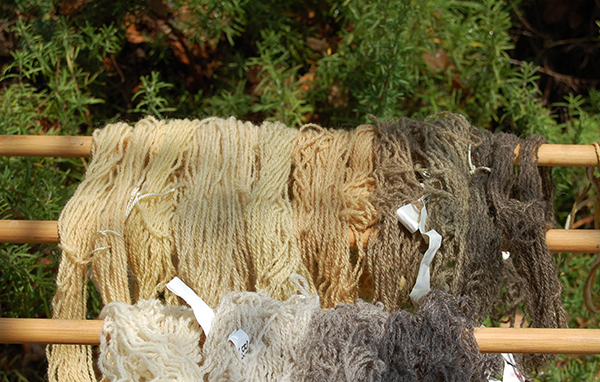 I seem to be wandering into various non-dye projects. 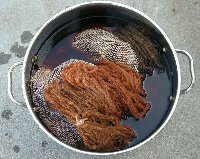 As far as the dye plants go there is the ongoing collecting and drying my favorite invasive weed/dye-plant/Bee-snack – ie. 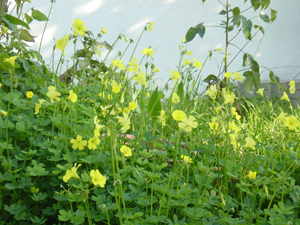 Oxalis. 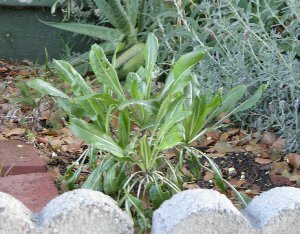 The woad and weld in the ground is surviving what passes for winter out here but the woad in-planter (on the porch) was nibbled down to the roots and what wasn’t eaten rolled over and died. 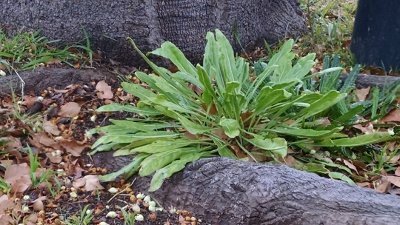 It’s probably not fair to blame the woad snacking on the Possums. We have a surprising variety of wild life that have adapted to city living: Racoons, Owls and Coyotes along with the Possums. Most of these aren’t seen too often unless you work really early or night shifts. 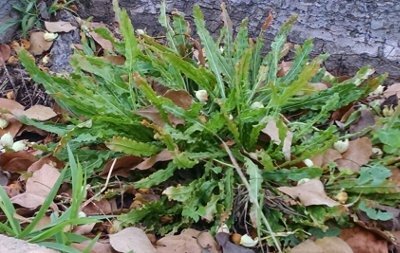 The 2nd year Woad plant. Dye, herbs, veggies and legumes coming up. Super Fennel. 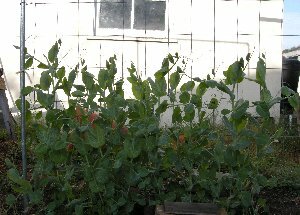 I pruned it down last fall a it is shooting back up. 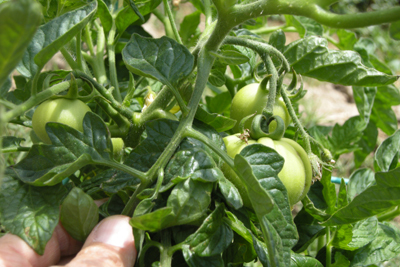 Tomatomania is a wonderful, mostly tomato (California local) plant sale. Lots of enthusiastic gardeners, more varieties of heirloom and homegrown tomatoes then you can imagine and generally good fun. My vegetable is so small everything merrily cross pollinates. This event gives me an opportunity to toss in some new varieties. 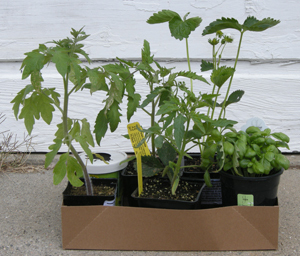 Tomatoes, Sweet Basil, Strawberry and Ladybugs. What I have right now are mostly pictures of dirt. Not much sprouting yet. 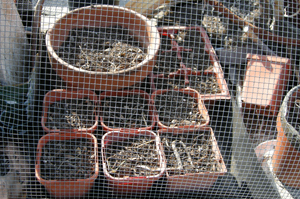 Dirt covered in hardware cloth so small animals (ie.my cats) don’t roll in it, or commit other unspeakable acts on the seedlings. 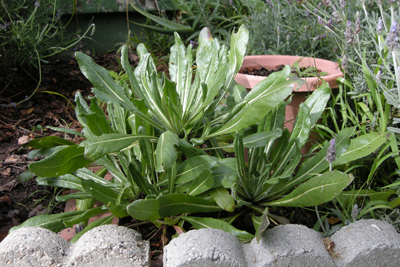 One project for this year is to see what I can manage with Woad and Weld in container garden. 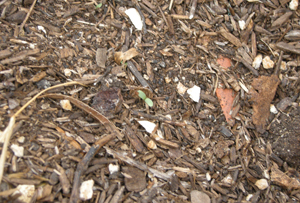 More dirt and something sprouting. 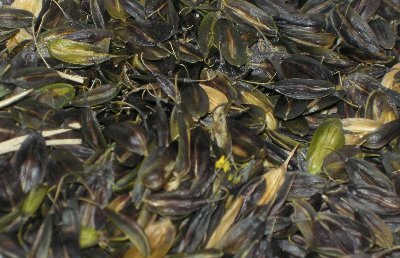 Since last week I started harvesting Woad seeds as they are ready. 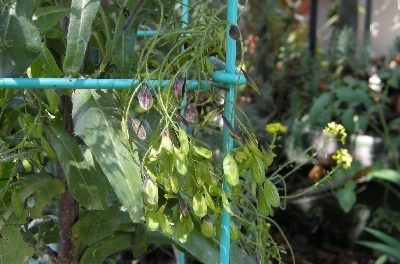 Tomato cage wrapped around the plant going to seed – so it doesn’t fall over. 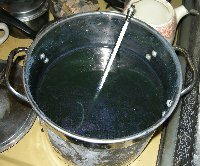 This last year I didn’t process enough Woad to dye more than a pair of socks or gloves and I’m still buying Woad powder along with processing my own. Next year I’m planning for more plants. More of my neighbors are planting vegetables in their front yards so no one will be surprised by the expanding herb and dye garden.